You have surfed the net, torn out magazine articles and if you’re a bride, you’ve probably got a few bridal expos under your belt... you’re armed, locked and loaded. You have a vague vision and general direction that you want for your special event. But, where on earth do all the pieces go? How do you get them all in the same room? That’s where we come in, providing you an opportunity to pick our brains and receive guidance from us, on how to execute your special day. You have decided that you want to celebrate something, host an event, raise funds for a special cause OR you’re getting married! You need someone to guide you from the moment you pick a date, up to the moment that you bid your last guests a good night. Pamela Hewlett Events can orchestrate every detail of your event from A-Z! We take on all of your headaches and free your mind, so that all you have to focus on is hosting, the thank you speech or farewell toast! You have planned every detail of the BIG day and you’ve put all of the pieces into their proper places. But, you’re the host or guest of honor... you need someone to ensure all of the logistics of your big day are handled with precision and priority. You need someone who can ensure that all aspects of your event go off without a hitch! That's us! 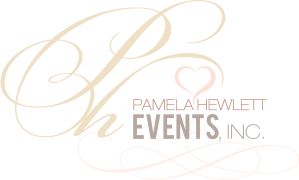 A dedicated member of Pamela Hewlett Events will take over the reigns and handle all of your “day of” tasks, making sure all of your hard work comes to a vibrant life.